I’ve compiled this page to distribute information about orders, leather, etc. I hope you find it helpful. If you have questions that are not answered here please contact me. Built to Order: Our goal is to get your gear to you as quickly as possible without sacrificing quality. At this time, most orders are shipping in under 3 weeks. Custom Order: Turnaround time on custom orders vary depending on the specifics. Contact me to discuss your build, get a price quote, and an approximate timeline. Stock Items: We usually ship the next business day. We ship all pieces of your order together so if you order a “next business day” product with a “built-to-order” product all pieces of your order will ship when your whole order is ready. If you would like me to ship “next business day” pieces quicker please let me know. Note: There are times that units or individuals need gear in a specific timeframe for training or deployment. I do my best to get you what you need when you need it. If you have a requirement that necessitates a specific timeline please contact me to work out the details. I usually ship USPS First Class or USPS Priority depending on the weight of the order. Below are the US and military address rates. At this time we are not shipping to civilians outside the US. If you represent a military or law enforcement department please contact me for a shipping quote. Family – There is a very short list of what’s more important to me. The one on the left there is Noble, he is four and can look into your soul. The one next to me is Elisha, we named him that because it means “The Lord is my salvation”. The doctors told us Eli would not be born alive, it’s a long story but the bottom line is that he was born alive and while the doctors don’t know how to explain it, I do. He is six now and loves to run, fish, hunt and hit his dad with nunchucks when he’s not watching. The little one my wife is holding is Judah. Judah is one and a half, just started sleeping through the night, but he was totally worth it! The pretty one in the middle there is my wife, Erin she has put up with me for an awful long time and I couldn’t be more thankful. You can see more about what she does here www.ErinDavis.org. I say all this to communicate that Lenwood is not my first or even my second love. Don’t get me wrong, I really enjoy making great equipment. I love the creative process and I’m honored to support those who protect and serve both stateside and deployed. But I really love my family. Sometimes that means some orders have to wait a few days because the family takes priority. I do my best to get orders out as quickly as possible but if you are not OK with waiting a little while it would be best if you ordered from a retailer who carries Lenwood or another artisan. At Lenwood we only use premium Kydex®. There are a variety of grades of Kydex® and many holster companies cut cost by using recycled and lower quality Kydex® variants. We do not. Additionally, after extensive testing in the shop and field I’ve come to the conclusion that .08 thickness is the right choice for our Specter, Wraith, and Full Battle Dress holsters. The extra thickness over .06 reduces the visible impression on the exterior of the holster but improves lifelong durability and rigid retention. Due to the unique design and function of the Shadow clip on holster I’ve determined the flexibility of .06 Kydex® is the right choice. I use premium leather. For each peace I select the best possible weight, type, and cut of leather. This does not mean it’ll never have a mark or blemish. I prefer US harvested leather and use it whenever possible. The thing is we use barbed wire to keep our cattle under control here in the US. That means there will, from time to time, be marks in the leather, and inconsistencies in the color. Most people love this about leather, I do. But if you don’t, maybe you should buy your belt at Wal-Mart. I offer 4 primary color options. Black, Dark Brown, Brown, Oil Rubbed, and Natural. To discuss the possibility of a custom color selection contact me. It’s best to keep your leather dry if possible and not abuse it. If it gets dirty you can wipe it down with a damp cloth but don’t get it very wet. For non molded leather I recommend Lenwood neatsfoot oil as a conditioner and Lenwood Seal as a way to seal up your leather. Alternatively camp dry is not bad. Never apply any conditioner or water to molded leather. 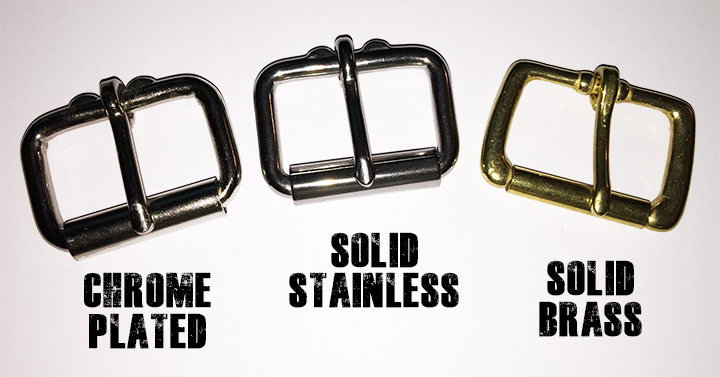 I offer four color options for my standard buckles. Chrome Plated Steal, Solid Stainless Steel, Solid Brass, and Black. If you would like to have me try to track down something different for you let me know and I’ll see what I can do. I use these particular buckles because of strength and durability. I use roller buckles because it protects your belt and ensures the longest life possible. Put your current belt on how you would normally wear it including any firearms or accessories, take note of the hole you use. Then, take your belt off and measure from where the leather folds over the buckle to the hole you were using. That measurement will be the center of 7 adjustment holes in your new Lenwood belt. Keep in mind, Lenwood Hybrid and Double Layer belts are more rigid than a regular belt. Because of this, if you are in between sizes, I strongly suggest going with the larger of your options. Another guide is to add two to your pants size. 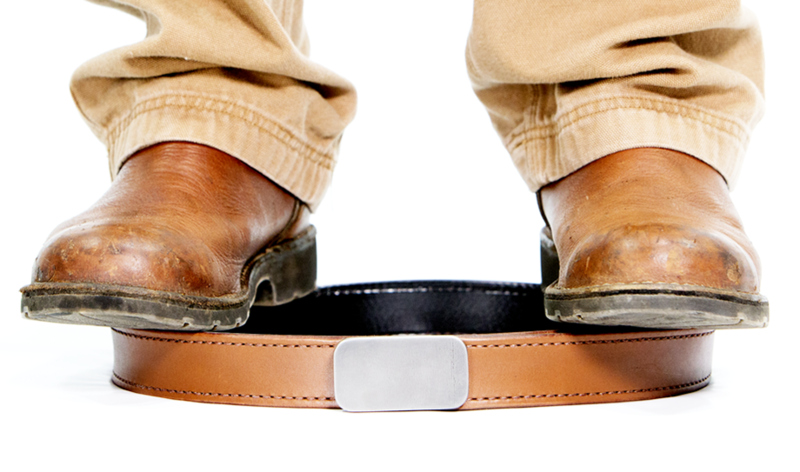 For instance, if you buy size 36 jeans, you’ll likely want a 38″ belt. Pretty much the same as above but I doubt your dog will need to include the gun. If you don’t have a current collar simply measure around your dog’s neck at about the tightness you will want the collar to be. I’m relatively easy to get along with and do all I can to take care of my customers and make sure they are very happy with their decision to buy from me. However, there are those who are not so easy to get along with, they are cranky, cantankerous, obnoxious, hateful, etc. If you are one of these people please do business with one of my competitors. If you are not one of these people I’d be happy to make you a piece of equipment you won’t be able to stop annoying your friends and family about because you love it so much. If you are a current or past member of the U.S. Military or law enforcement please contact me. I’d be proud to offer you a discount code. Lenwood is committed to doing all we can to promote a safe and secure education space for students. As a father myself I want my children to be protected. We are offering one free Specter holster for teachers who are officially and legally armed in an effort to protect our nation’s most valuable resource, children. To take advantage of this offer please contact me. You will be asked to provide a letter from your school board, superintendent, or principle. Once confirmed we will build a Specter holster for your firearm and ship it to you. My grandpa taught me to “promise small and deliver big”. This has been a guiding principle in life and business. Because of this I’ve been hesitant to publish a warranty but as Lenwood grows more and more people are asking. So I’ve decided to post my thoughts below. – If you get your order and it doesn’t fit send it back (before wearing it and within 7 days) and I’ll replace it with one that will fit. Contact me first so I’ll know what to do when the return arrives. – If you are not happy with your order when you get it contact me (within 7 days) to let me know why. Then we can talk about the best option to make sure you get what you want and need. – If you are using your Lenwood product properly and for some reason it comes apart contact me. I’ll either fix or replace it. – If you abuse your Lenwood product it and tear it up contact me and I’ll repair it for a fee. Contact me, be honest, and we’ll work it out. – If you alter your Lenwood product you are on your own. DO NOT ALTER A LENWOOD PRODUCT. – If your Lenwood product get’s damaged in the line of duty contact me and I’ll do what I can to fix or replace it. I’d like to hear the story! Always contact me prior to sending anything in for repair or replacement. I want to know what to do with it when it arrives.